Venue: St.Alex Church Hall, Calangute, Goa, India. 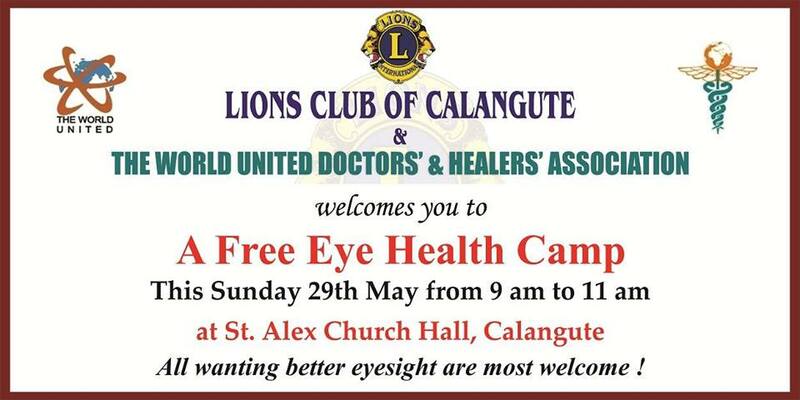 Description: Welcome to a Free Eye Health Camp by The Lions Club of Calangute & The World United – Doctors’ & Healers’ Association, this Sunday, 29th May’16, from 9am to 11am at St. Alex Church Hall, Calangute. This unique eye camp will start with eye checkups and giving the eye numbers first. It will be followed by a ½ hr class by Darryl D’Souza, Secretary of The World United – Doctors’ & Healers’ Association, on reversing eye problems through diet, acupressure and the use of power vision kit for eye number reversal. This class will happen on the 1st floor hall inside the church. An eye camp with these many benefits has never been done in Goa as yet, so please take full advantage of it, and pass the word around to as many others as possible.